A former CIA agent who leaked a covert officer's name to the media has been sentenced to 30 months in prison. John Kiriakou, 48, pleaded guilty in 2012 to violating an intelligence law. No-one had been convicted under the statute in 27 years. He admitted passing on the name of a former officer who was part of the interrogation of detainees, including alleged waterboarding. Defence lawyers argued that Kiriakou was a whistleblower. US District Judge Leonie Brinkema rejected that argument, and said she would have given him a longer sentence if she could. A plea deal required the former agent be sentenced to 30 months. The investigation began after lawyers for suspected terrorists filed a legal brief, including details not provided by the government. The trail led back to Kiriakou, according to court records. Prosecutors said the former officer leaked the name of a covert operative to a journalist, who subsequently disclosed it to a researcher working for the lawyer of a Guantanamo detainee. They argued Kiriakou was merely seeking to increase his fame and public stature by trading on his insider knowledge. A separate charge, involving an alleged disclosure to a New York Times reporter, was dropped as part of the plea deal, the Times reports. Kiriakou was an agent with the CIA between 1990 and 2004. In 2002, he led an operation that captured Abu Zubaydah, a suspected al-Qaeda financier, who was allegedly waterboarded 83 times. 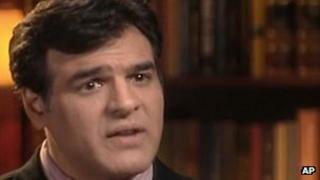 In 2007, Kiriakou said in an interview with ABC News that waterboarding had been used to break down Zubaydah. Kiriakou later worked as a consultant for the US news network and published a book, entitled The Reluctant Spy: My Secret Life in the CIA's War on Terror. A charge related to the book was also dropped in the plea deal. CIA tactics: What is 'enhanced interrogation'?